Phillip is the joint research coordinator for the Rosemond lab and the Wenger lab in the River Basin Center here in the Odum School of Ecology. Phillip received his MS in ecology at the Odum School in Dr. Rosemond’s lab where he studied how nutrient enrichment altered the growth and diet of larval salamanders. 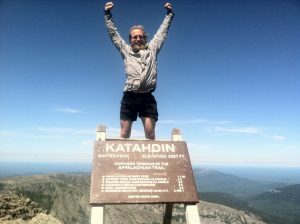 Phillip coordinates most research in the lab and is the project manager for the stream warming study at the Coweeta Hydrologic Lab in North Carolina. He also oversees the macroinvertebrate portion of a project investigating how different flow conditions affect ecosystem structure and function, including stream metabolism, nutrient retention, and secondary production. Additionally, he is involved in a project focused on urban streams that is trying to understand patterns in conductivity in Athens streams and develop a real-time sensor network to use conductivity as a management tool. 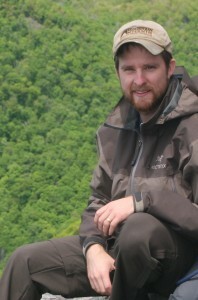 Phillip is broadly interested in how global change affects stream ecosystem structure and function with a particular interest in nutrient enrichment, climate change, and urbanization. I am interested in how human activities, especially management practices, impact freshwater ecosystems and how scientific research can be used to better inform these management practices. My current research aims to quantify the effects of different flow conditions, and thus different management strategies, on the key ecological functions of stream metabolism and nutrient retention. Specifically, I am examining the role primary producers, both in the water column and in the benthos, in these ecological functions in response to varying flow conditions. 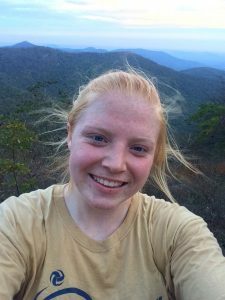 Carolyn joined the Rosemond lab in Fall 2017 as part of the Master’s in Ecology program after receiving a B.S. in Biological Sciences from Colorado State University in December 2015. 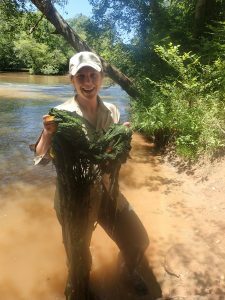 After working in various lab and field settings, Carolyn became interested in how aquatic organisms, especially macroinvertebrates, respond to anthropogenic stressors such as climate change. 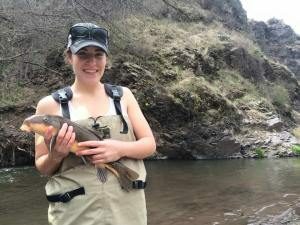 Her research in the Rosemond lab will examine the effects of stream warming on freshwater ecosystem function with a focus on how litter breakdown rates and macro invertebrate physiology differ across temperature gradients. 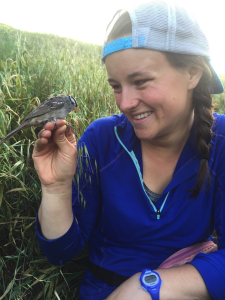 Emily joined the Rosemond and Wenger labs in 2016 to pursue a Master’s in Conservation Ecology and Sustainable Development after receiving a B.S. in Conservation Biology at Kansas State University. At K-State, she was involved in research that investigated fish and macroinvertebrate community responses to climate change-induced wildfires in the southwestern U.S. Her current research interests are centered on urban watershed management, specifically as it relates to water quality in urban streams. Emily is currently working on a project within Athens-Clark County to examine the influence of urban inputs on the conductivity of local streams and the macroinvertebrate communities within them. Nate is the research technician for the stream warming project at the Coweeta Hydrologic Lab. Nate received his MS at the Odum School of Ecology with Dr. Krista Capps where he studied factors controlling the uptake of heavy metals in lotic ecosystems. Nate is interested in stream ecosystem function and how elements move through ecosystems and organisms. If you would like to consider getting research experience in the lab contact Dr. Rosemond or Phillip Bumpers. I am a fourth year ecology and marketing major with a desire to generate change that will further the sustainable continuation of human existence in harmony with nature (lofty, right?). I’m primarily interested in marine ecology, but I’m excited to see what other areas of interest I develop in the rest of my time at UGA. After graduation, I hope to build on my ecology major by working in Latin America to both gain field experience and to improve my Spanish. Currently, I’m working as an undergraduate research assistant to Carolyn Cummins in her stream warming / leaf litter breakdown project. I am a second-year student at UGA, double majoring in Biology and Ecology. Currently, I am working with Carolyn Cummins on the stream warming project in the Rosemond Lab. I am very interested in evolutionary biology, as well as how changes in an environment can impact an ecosystem. Isabel is working with PhD student Caitlin Conn. See Isabel’s bio here. 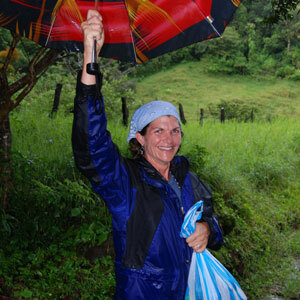 Isabel is working with PhD student Caitlin Conn. See Andres’s bio here. There are a lot of great former Rosemond lab members. Meet our alums and see what they are doing now.